A 3-bedroom end of row stone built property enjoying far reaching views up Standedge and the Pennine hills beyond from its elevated location. It is a well cared for and very nicely presented home with a stylish fitted kitchen, and modern white bathroom suite. FULL DESCRIPTION A 3-bedroom end of row stone built property enjoying far reaching views up Standedge and the Pennine hills beyond from its elevated location. It is a well cared for and very nicely presented home with a stylish fitted kitchen, and modern white bathroom suite. The property has gas fired central heating, and majority double glazing. There is a well-tended garden to the front, garden to the side with access to a garden shed, and a much larger terraced garden at the rear which has a sizeable decked patio area being ideal for outside entertaining, lawned areas, rockeries, and well stocked flower beds. The property is only a short distance from the village centre offering an array of shops, cafes, train station, and regular bus services. HALLWAY With stripped and polished floorboards, and staircase rising to the first floor with attractive wall detailing. LOUNGE 16' 5" x 13' 5" (5m x 4.09m) The main focal point is a cast iron fire surround and inset with a living flame coal effect grate and tiled hearth. The large window provides delightful views to the front towards the Pennine hills. This room also has picture railing, and polished floor boards. DINING KITCHEN 16' 8" x 9' 11" (5.08m x 3.02m) Fitted with a modern range of high gloss fronted wall, drawer and base units with work surfaces over incorporating a 1½ bowl sink with mixer tap. There is a 4-ring ceramic hob with extractor hood over, electric oven & grill, space and plumbing for a washing machine, space for a fridge/freezer, enhancer lighting above the work surfaces, LED plinth lighting, tiled floor, window offering views up the garden, external door to the rear, and access to a useful under stairs storage cupboard. There is ample space for a dining table. LANDING There is timber balustrading and newel post around the top of the staircase, picture railing, and access to the loft. BEDROOM 1 16' 2" x 10' 9" (4.93m x 3.28m) A spacious double bedroom with a fitted recessed wardrobe with natural wood door, pretty cast iron bedroom fireplace, picture railing, and far reaching views to the front. BEDROOM 2 10' 9" x 10' 2" (3.28m x 3.1m) This double bedroom also has an attractive period style bedroom fireplace, picture rail, radiator cover, and views over the delightful rear garden. 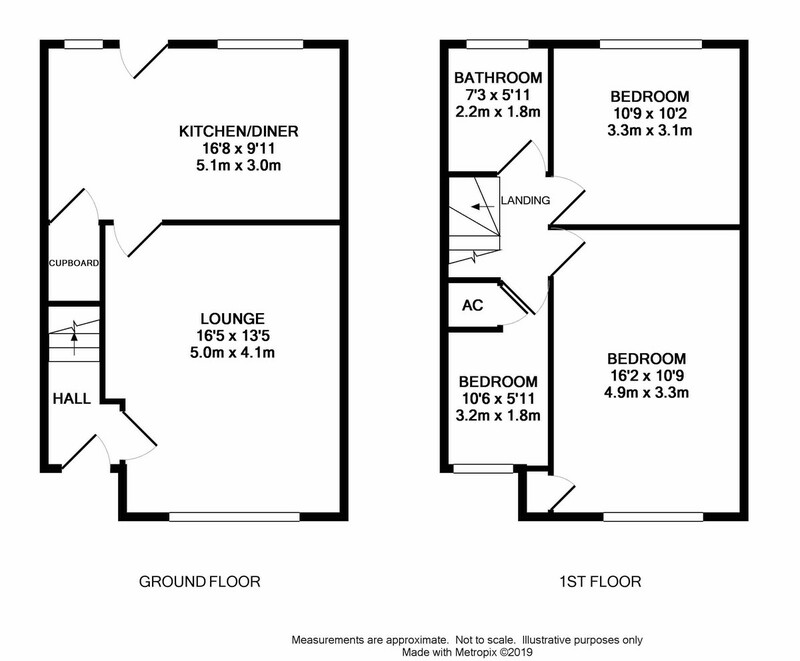 BEDROOM 3 10' 6" x 5' 11" (3.2m x 1.8m) A single bedroom or home office having timber effect flooring, bulk head storage cupboard, and views to the front. BATHROOM 7' 3" x 5' 11" (2.21m x 1.8m) Fitted with a modern white suite comprising panelled bath with Triton shower over, pedestal wash basin, and low flush w.c. There are tiled walls, tiled floor, and frosted window to the rear. OUTSIDE There is a well-tended mainly lawned garden to the front with access to a garden shed, rockery, and sitting area to the side. There is a much larger terraced garden at the rear which has a sizeable decked patio being ideal for outside entertaining, lawned areas, rockeries, flower beds, and a period style outside lamp. LOCATION From the A62 in Marsden, take the B6107 Meltham Road, and after passing Carrs Road on the right, take the next right up Woods Avenue. The property can be found up the first turning on the left.